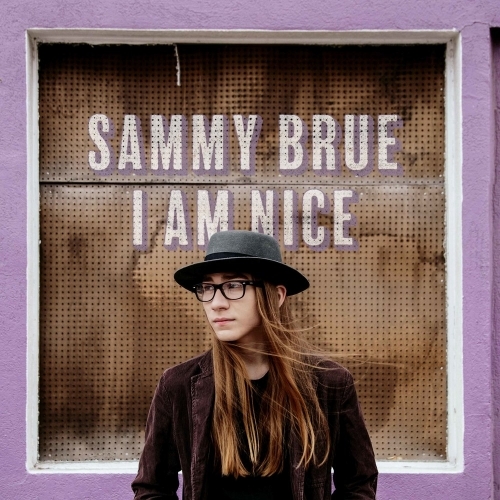 Granted, Sammy Brue‘s helpers are of an already impressive pedigree, the album having been jointly produced between John Paul White of The Civil Wars and Ben Tanner from Alabama Shakes, but listening to I Am Nice, you find yourself with an unshakeable belief that, no matter who was at the helm, it would have panned out equally impressive. Make no mistake, Brue is a serious artist in his own right, and you can only predict that he has a bright future ahead of him. Given the obvious talent on display, one can only hope that next time he gets someone else to title the album…but then, I kind of like the fact that the title is so appalling – maybe that’s the whole point and it’s meant to be tongue in cheek. I guess we’d better give him benefit of the doubt. The most obvious blueprint for I Am Nice is Bob Dylan, from the subterranean homesick rattle of ‘Covered In Blood‘ to the diction and delivery of the jangly ‘I’m Not Your Man‘, yet the teenager never lapses into blind sycophancy nor lazy pastiche. Most pleasingly though, is the fact that, instead of wallowing in self pity like most teenagers (and hey, I know I did! ), Brue instead possesses a wicked sense of humour, so I Am Nice, instead of making you roll your eyes at a teenager’s self-pitying angst, rather amuses with lyrics like “Saying your name is like stepping on broken glass / The way that you said mine always gave me up a little laugh” on the fifties doo-wop of ‘Was I The Only One?’. Not that there aren’t some more tender moments on the Utah kid’s debut record. ‘Once A Lover‘, for one, is captivating in its despondency and quite beautiful as a result. Then you have tracks like ‘Control Freak‘, from whence the album takes its name. In contrast, this one demands that you throw down your hair and simply rock out, and due to its prominent Hammond organ (or is it a Farfisa? ), it reminds me of Rocket Science‘s ‘Being Followed‘, Inspiral Carpets, and Madness‘s ‘Bed & Breakfast Man‘ in equal measure. That should give you some indication of just how eclectic I Am Nice really is. Sammy Brue has got it goin’ on. Expect big things.